This is the era of online recharges! From DTH connection to mobile recharges, it is all happening online. 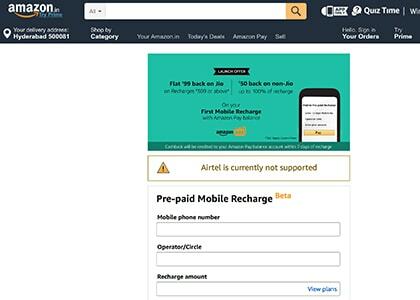 And in the recent times, one more brand that has added to the online recharge game is Amazon Recharge, using which online shoppers or any other customers, can recharge their mobiles and also get great discounts. This is what the Amazon Recharge coupons are all about. And if you want to have access to the best of the coupons all under one website, then you can opt in for the deals and offers that are listed on HappySale. Here the deals come with deal descriptions that you can read and then decide which deal to opt in for. Similarly, akin to other offers you have the chance to select from the promotional deals, cashback offers as well as the site wide offers. So keep browsing and select the best recharge deal for you! Verified on 22/4/2019 . Recharge your mobile at Amazon and get flat Rs 50 cashback. Valid on 1st recharge and minimum recharge amount is Rs 100. Not valid for Airtel users. Terms and conditions apply. Hurry! Recharge now. Amazon Recharge is offering cashbacks On Jio Recharge. Get Flat Rs 99 cashback on your Jio Recharge on Amazon.in. This is applicable on Recharges of Rs 309 and above only. This is valid only on your first prepaid recharge on Amazon.in with Amazon Pay balance. Only Recharges for which payment is made with Amazon Pay balance are eligible. The cashback will be credited as Amazon Pay balance within 7 days of doing the recharge. Get 20% cashback up to Rs 20 on subsequent recharges on Amazon.in. This is valid on all recharges done from Aug 9, 2017 to Nov 30, 2017. The total cashback a customer can avail under this offer is Rs 300. The cashback will be credited as Amazon Pay balance within 7 days of doing the recharge. Other than online shopping, this is also the era of online recharges! Gone are the days when you would walk up to the local mobile network connection store to have your prepaid account recharged or even wait for any remote vendor to get it done for you. Self service is at peak now. And keeping this in mind, the popular Amazon has come up with its Amazon Recharge coupons that are easily available online. From mobile collection to DTH recharge, you will be able to recharge all you want within just a click of the mouse. Wondering where to have access to these discounts and deals online? The answer is HappySale. This is one website where you have all the offers listed for you and designed in a way as well so that there is something for everyone to select and opt in for. And you just don’t need to keep all these offers to yourself. You can also share or refer the same to your friends and family that will enable them as well to save on online recharges. Making use of Amazon Recharge promo codes means saying yes to a host of offers! For instance, you have the chance to get an Rs.99 cashback offer on your Jio recharge. Furthermore, if you are a new Jio users, then there can be deals dedicated for you. Some of the brands that offer these discounts and coupons are from popular brands such as PayUMoney, True Balance, Mobikwik, Airtel and many more. You can get Rs.20 off on all of your recharges as well. From promotional deals to the site wide offers, there are plenty of choices you have. Customers waiting to select from the best and real Amazon Recharge coupon codes should know that the great deals are only available at HappySale. So they can browse through this website, search for the deals, read the same and finally opt in for the one they like. Go get your deal toady!